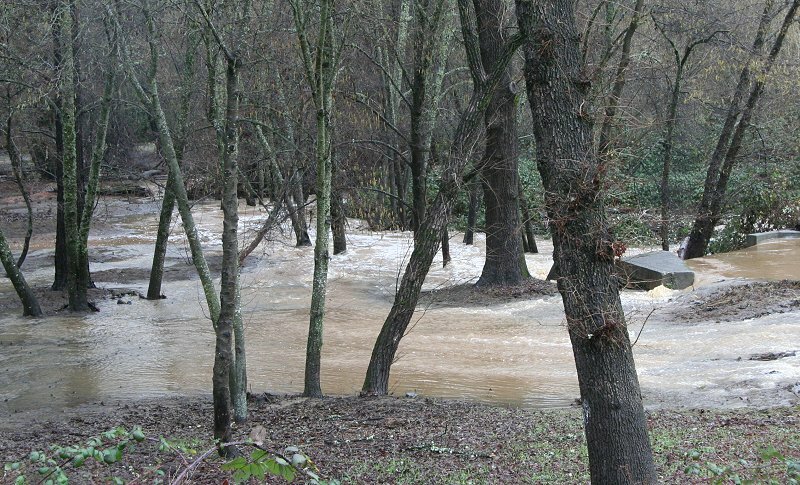 The last time I remember flooding as severe as this morning was on February 9th, 1999. 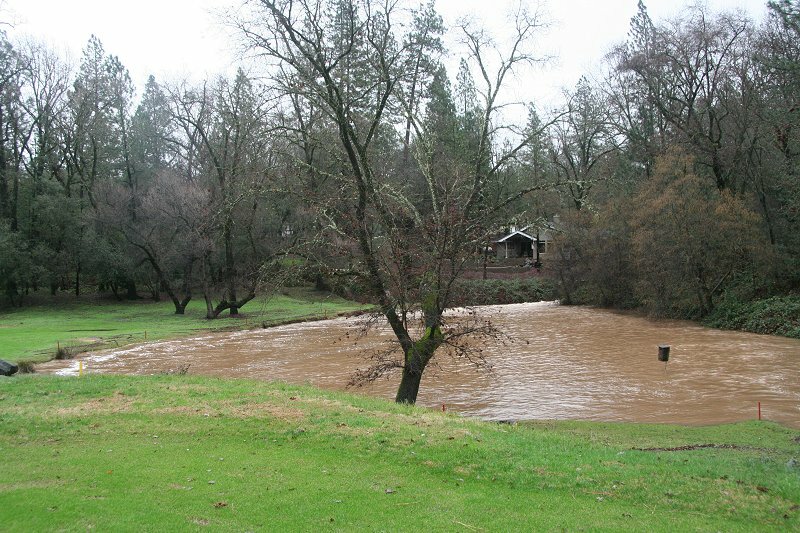 It's been raining since December 20th with no letup, save for two isolated days. Last night the wind blew and the rain came down hard and steady until dawn this morning. 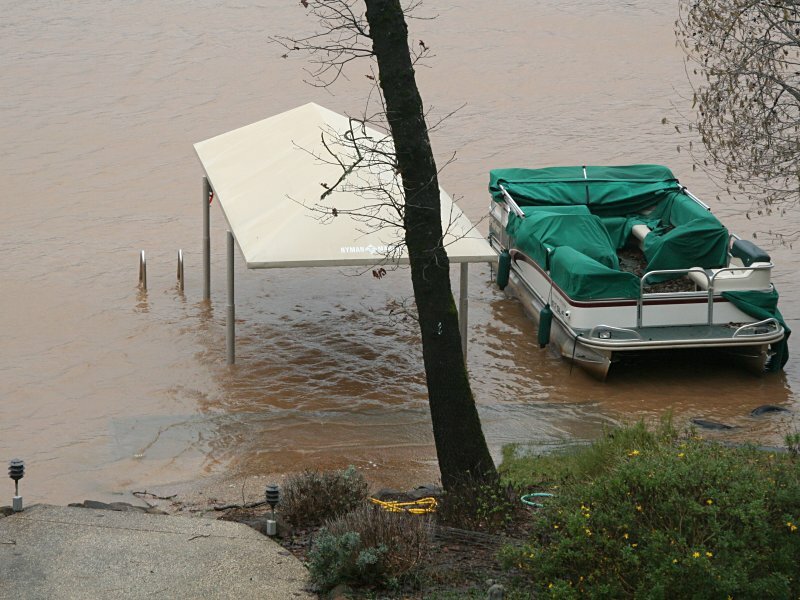 I was worried about the covers blowing off our pontoon boat because one of them was hanging over the side and holding on only by a few snaps as we went to bed. I didn't go down to the dock to secure this cover because it was raining cats and dogs. 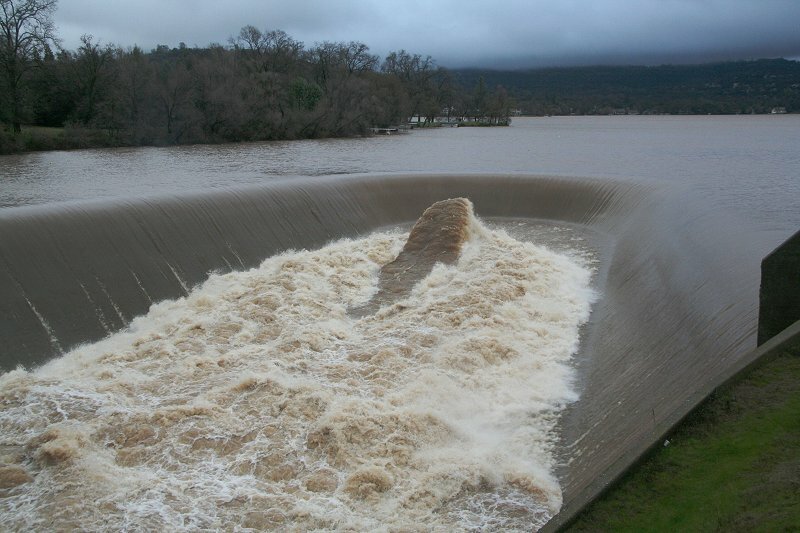 Barbara and her family had never seen the "rooster tail" that forms at the Lake Wildwood spillway when the lake level is a couple feet above the top, as it was at 9:10 a.m. Andy, Barbara, Nadia and I hopped into Andy's car and drove to the spillway. 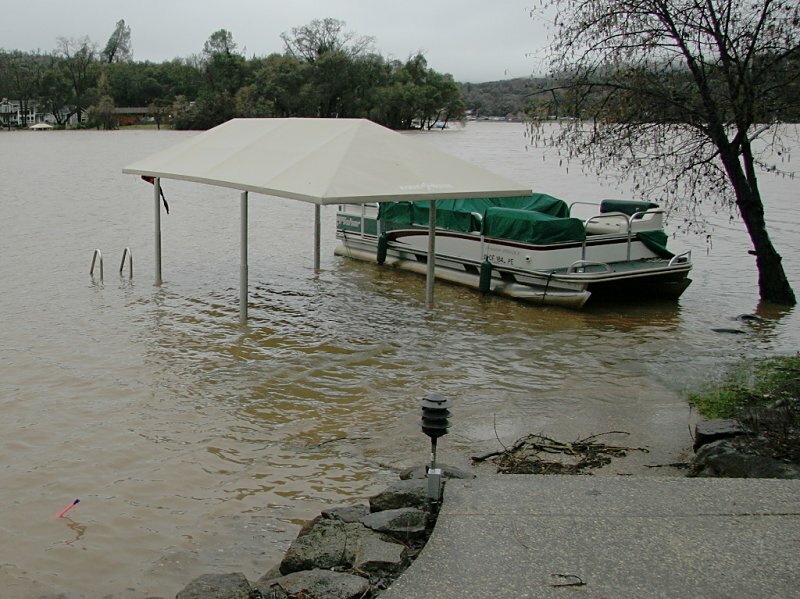 When we returned home at 10:11 a.m. the water level at our dock had receded about 4 inches, so the dock landing was almost uncovered. An hour later the dock landing was just exposed. 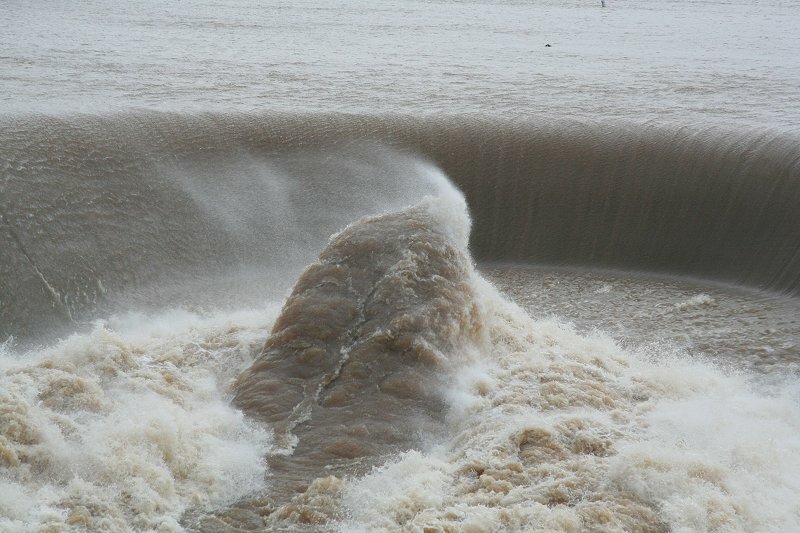 The rooster tail at the spillway didn't disappoint us (9:26 a.m.). 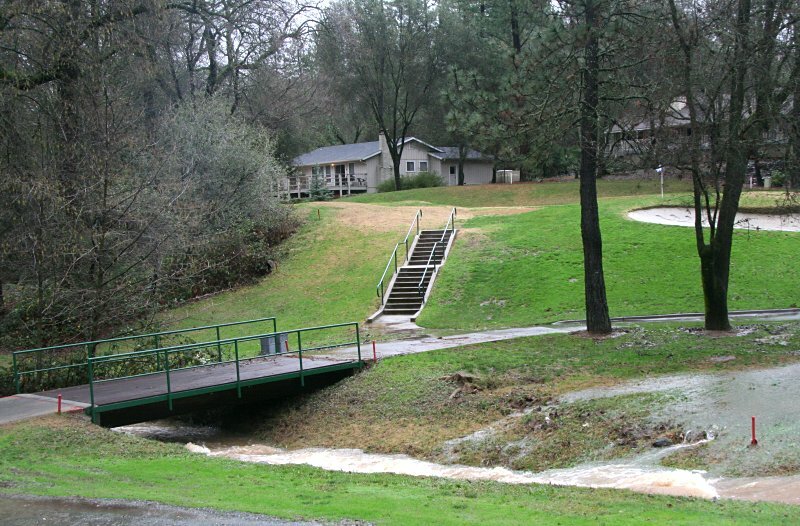 On our way to the spillway, as we drove toward the gate from Chaparral Drive on Lake Forest Drive we could see that the woods on the left side of the 4th fairway were flooded with water flowing swiftly through them. When we returned to the main gate after viewing the rooster tail we therefore drove straight in and parked along Lake Wildwood Drive just past the water fountain on the second hole. 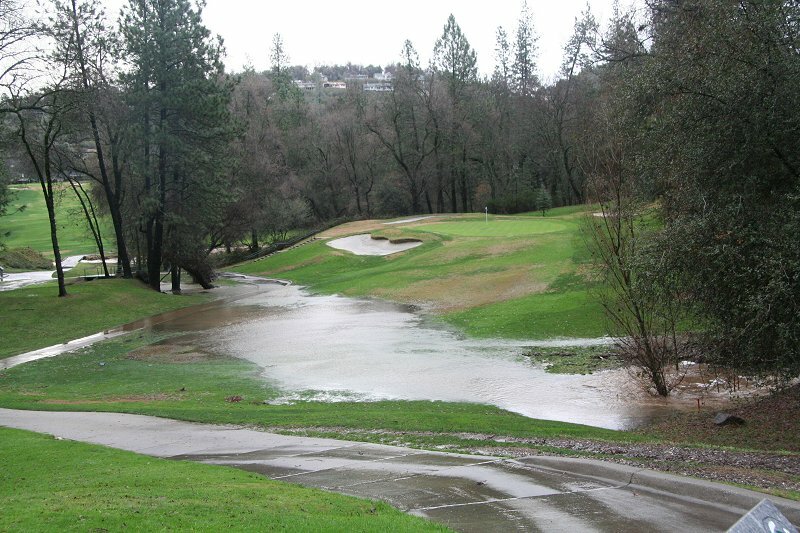 Then we walked back the short distance to the 3rd tee and saw a river flowing across the fairway. 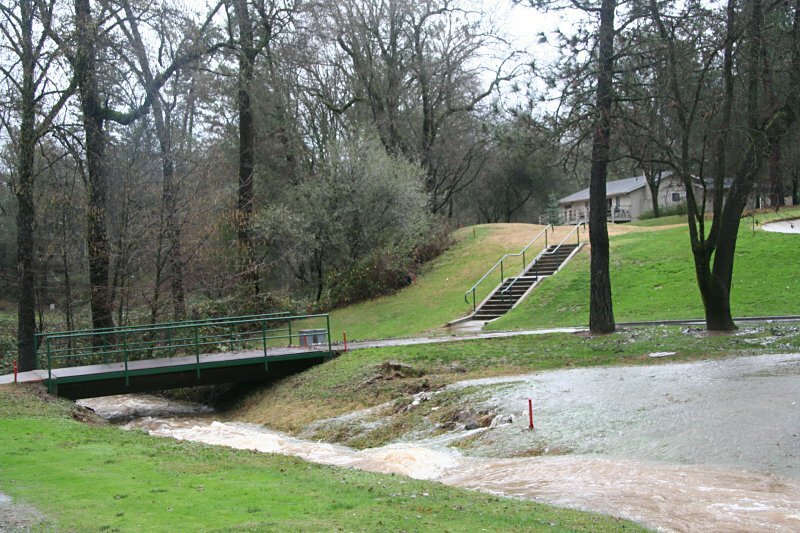 The river roared in the ditch that separates the 3rd green from the 4th tee. the woods along the 4th fairway (viewed from the tee). The other side of the 4th tee pond, with Steve and Mary Moyer's home in the background. 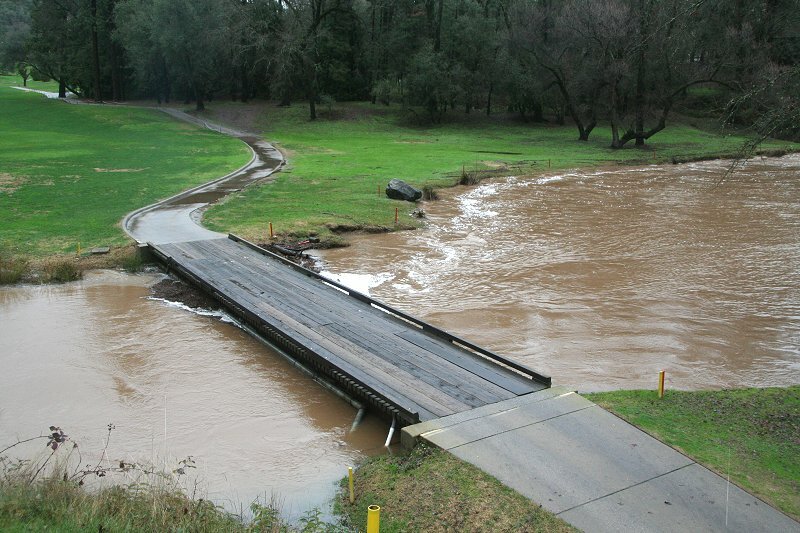 Pond water was lapping at the bottom of the bridge to the 4th fairway. 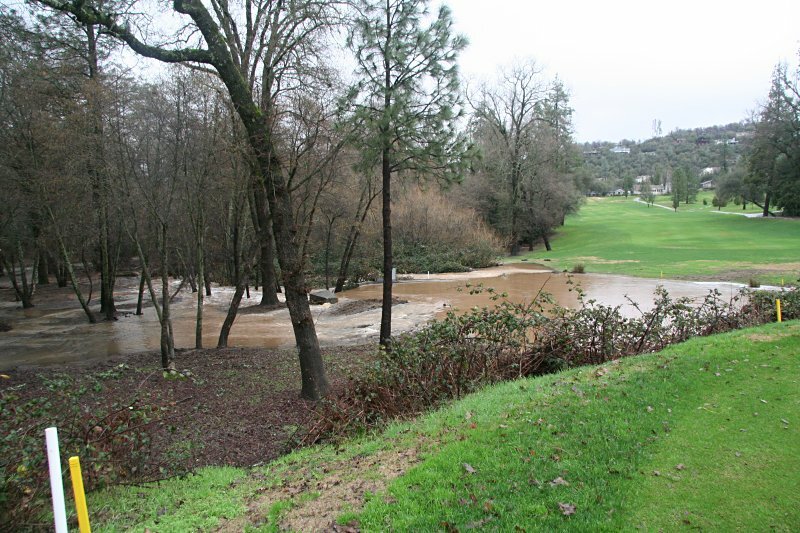 Had I been alone I would have driven on to the 8th hole and its rushing river, but Andy and Barbara had to be on their way home to Los Altos. As I type this Andy called to tell us they're caught on Route 80, which was closed near Fairfield because of flooding. The latest news flash, as I type at 5:30 p.m., is that they took back roads and Route 12 then 880 and are now approaching Milpitas. All's well that ends well. About one p.m. as I was beginning this Web page our power went out, so I went down to the dock to make use of my time cleaning up the pontoon boat (accumulated leaves from the windy rains) and securing the seat covers. It was possible to do so because the lake level had dropped another foot and our dock was up out of the water about six inches. Moral: if you want to see some of these events in person you have to hustle because the water level drops at about 4 inches per hour after the rain stops.